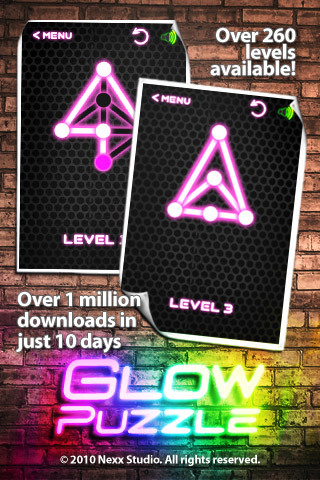 Developer Quote: "Glow Puzzle is a simple yet very addictive neon themed puzzler." Open the puzzle and choose to either Play or read the Tutorial which is a nicely done animation of only one page. Not much rules are needed making the game simple and enjoyable. Tap play and then select your level. The outlined shape will be displayed and all you have to do is start connecting the dots in the right way. If you do your job well, the image will glow and you need only tap Clear to move on to the next level. This puzzle is one that I would categorize as relaxing yet addictive at the same time. COOL CONCLUSION: "Glow Puzzle is uncomplicated fun, suitable for all ages and will be especially enjoyed by puzzle lovers!"